Post-it notes were created thirty-eight years ago by Arthur Fry in order to improve bookmarks that always fell out. Since then, post-it notes have become a staple of office culture and up until recently seemed virtually irreplaceable when brainstorming and laying out ideas. Yet today, it is commonplace for things around us to have disappeared, only to be transformed into one of the numerous apps on our devices. The same thing has happened with post-it notes. 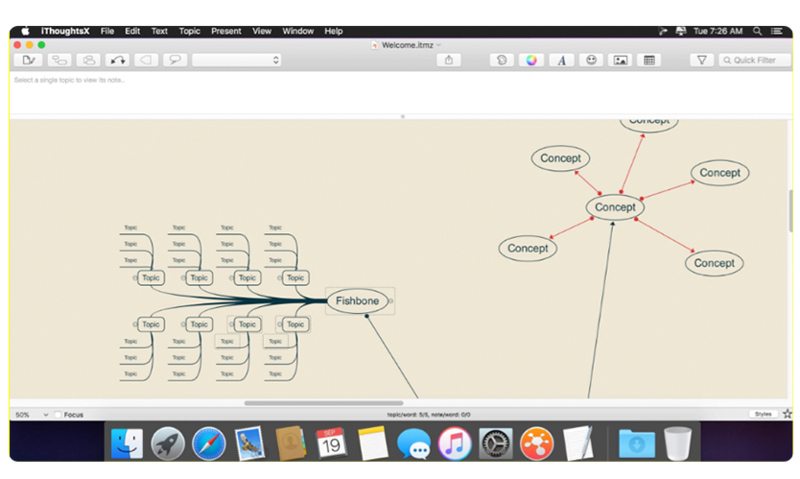 So, if you want to come up with some ideas regarding a new project and design it in a creative way, the best thing you can do is to download mind mapping software for your Mac. A mind map is a spider diagram or tree-like image that represents and links thoughts, ideas, tasks, keywords, and even images. Mind mapping as a thinking technique was greatly promoted by Tony Buzan, an English author who deals with education. Buzan refutes the idea that a reader has to view the page from left to right and top to bottom. In reality, he contends, a person "scans" the page entirely and non-linearly. Graphic methods of recording knowledge and modeling systems have been used in teaching methods, brainstorming, memorizing and visual thinking for centuries, in order to solve problems that have arisen in fields related to teaching, engineering, psychology, and other academia. The earliest application of mind mapping was discovered in the philosophical works of Porphyry of Tyre (3rd century AD). He graphically depicted the concepts of categories relating to Aristotle’s philosophy. Indicate in the center of the picture, with one or two words, the basic problem being analyzed. Circle this concept — other thoughts will grow out of it. Draw branches — the main related concepts, properties, etc. We subscribe to them with one or two words each. Each branch is divided into several finer forks — the development of these concepts, the detailing of properties, directions of work. Now choose a couple of colorful pens and highlight needed ideas, concepts, etc. That is the easiest way to draw a mind map. Undoubtedly, the harder your task or problem, the more complicated your thought diagram will be, comprising even more branches and nuances. Your primary task is to learn how to keep track of your thoughts in a way that will be convenient and understandable to you, even at a later date. The rest does not matter. When Should You Use a Mind Map? Implementing mind map tools into your day-to-day tasks and responsibilities can dramatically maximize your working efficiency. Morning does not start with coffee. Mind maps give a great start to your day. To get into the swing of things, you need time. It is mind diagrams that help you spend this time wisely. Plan tasks for the day, highlight the ones of greatest priority, add new ones, and include ideas that have emerged during the evening-night-morning-weekend. Mind maps amass your ideas. If you have a great idea, do not rely solely on your memory. Better put it in a mind map. If one of your colleagues comes to you and says that it would be good to solve a certain problem, add it to the map as well. What is not included in the mind diagram you’ll certainly forget after a short period of time. The tasks that are on a mind map are much more difficult to ignore or put on the back burner. Mind maps help keep control of huge projects. If you’ve got a big task, e.g. a large event, and you have no clue where to start, mind mapping can come in handy, permitting you to divide your idea into smaller elements and fix it. The scope of work will be more specific, and it will be much easier for you to move on to implementation. Modern technologies have made mind mapping even more powerful, functional and accessible. Depending on the digital app, you’re able to add different additional elements to your diagram to enhance understanding and add visibility. These elements can be photos, images, screenshots, texts, videos, references, or any other additional materials that you think may be helpful. 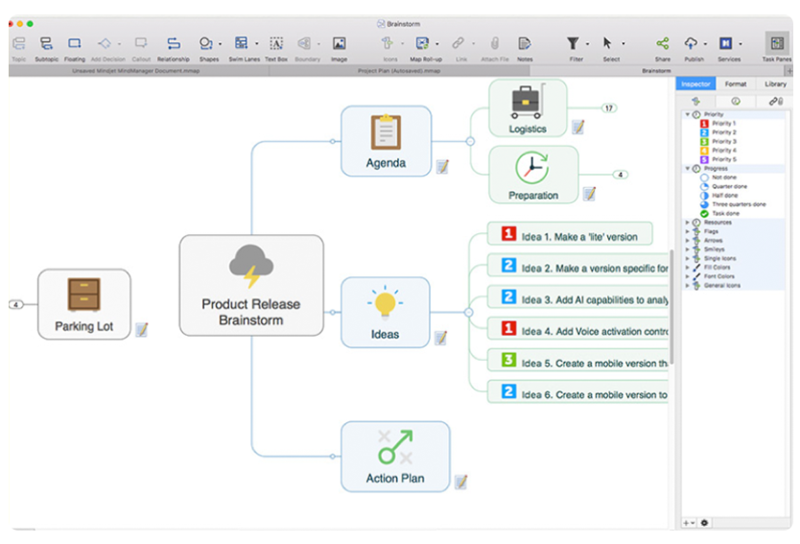 To figure out which mind map solution suits your project, we prepared a list of the top 5 pieces of mind mapping software for Mac (according to our humble opinion). Intuitive interface. Although the interface may look a little bit clunky, everything is very clear, so you do need to spend half an hour looking for a particular tool. Flexibility. The structure, coupled with provided options, enable users to view the nuts and bolts of their ideas in the look they prefer. The lack of collaboration. Xmind is not a web-based solution. That is why it would be not so easy to share it with other users or colleagues. Speed. One of the main negatives the app has is its speed. Unfortunately, it requires a lot of resources. This adds to the overall difficulty when dealing with data or diagrams. Price: Classic version — $129 / year; for teachers & students — $59; for governments & non-profits — $64.50. Requirements: macOS X 10.7 or later; Intel, 64-bit processor. Integration with many other services. You’re able to work with such services along with Mindomo: Google Apps or Office365 accounts, Canvas, Blackboard, Moodle, Desire2Learn, Itslearning, Schoology, etc. Searching for web images and videos. Students can make their maps more engaging by searching web images directly from the map and adding them with just one click. History of changes. Our playback mode lets you keep track of all the changes each student makes on a map: added topics, new connections, uploaded images and videos, etc. No spell checker. Mindomo doesn’t provide an orthographic checker. Your spelling and grammar is your own responsibility! Price: Free (only 3 maps); Premium - €36 / 6 months; Professional - €90 / 6 months; Team — €142 / 6 months; MacUpdate Price — $79,92. Full package. The app provides all possible features you could ever imagine for a mind mapping application. Features include due dates, task prioritization, to-do lists, mutual project planning, external docs and uploads, community forum, KPIs, budgeting, and many many more. Just give this app a chance and it will certainly astonish you. Too expensive. Although MindManager offers an exclusive pack of features that can enable you to create anything within your mind map, the price is simply too high. This app is more suitable for corporate usage, but not so much for students. Requirements: macOS X 10.11 or later; Intel, 64-bit processor. Supports multiple languages. In iThoughtsX, we’re able to choose not only standard English and its variants, but the most popular languages from almost every corner of the globe. Ample opportunities to create. 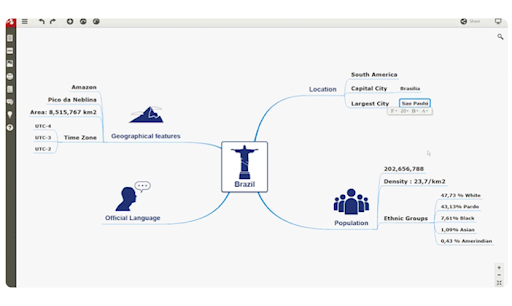 Everything you could ever imagine inside your mind map is now realized in iThoughtsX. The developers have even taken the trouble to list all the features. Limited Space. This one of the biggest problems of this app. You cannot scale it permanently. Therefore, when you get to the limit, the app can simply “crash”. In most cases, this happens because of small memory capacity. User-friendly drag and drop environment. Compared to a piece of paper in real life or even Paint, you’re not limited to the space provided. You can scale your project as much as it needs without compromising quality, clarity, or general perception. Fast Document Exporting. You can quickly and easily add needed documents into the mind map, and from the mind map, a user can save a created diagram in any needed format and then send it to other people. Scrivener connection. 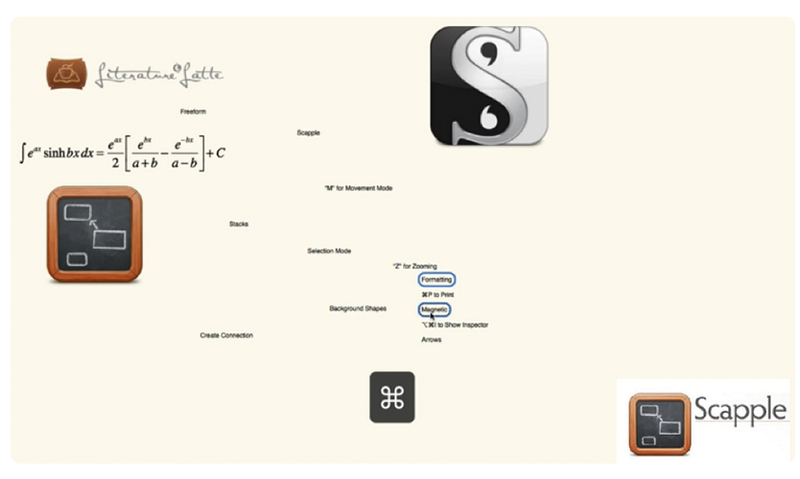 Being launched by the company Literature & Latte, Scapple is compatible with Scrivener — another product for writing projects. Too basic a toolset. Although easy to use, Scapple is often criticized. It was created by writers, for writers thus offers a basic set of features that is inappropriate when needed for a huge IT project. Price: The standard license — $14.99; The educational license — $12.00; a free trial version — 30 days. 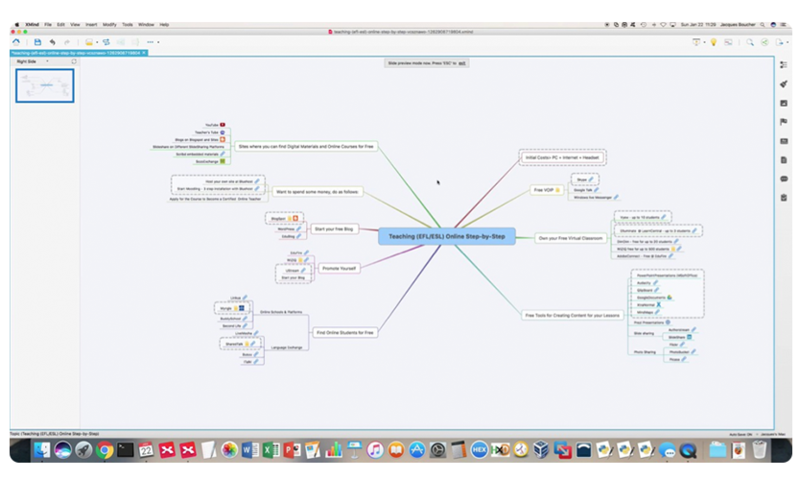 The market for mind mapping applications for Mac is full. Today, anyone can find an app according to their personal preferences and wishes whether it’s for work or personal affairs. All five mind mapping apps demonstrated in this article have their positives and negatives but are nevertheless used and enjoyed by many. Still, have doubts? Then try them all out!